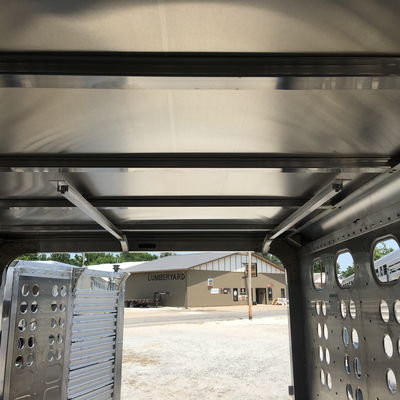 Legendary Merritt® Toughness is Built into Every Merritt® Trailer. Lowest life cycle cost and Greater resale value are key words when talking about the Aluminum Gooseneck Stock Trailer by Merritt® Equipment. Every bit as tough as the Merritt® large commercial trailers. Request a quote today! 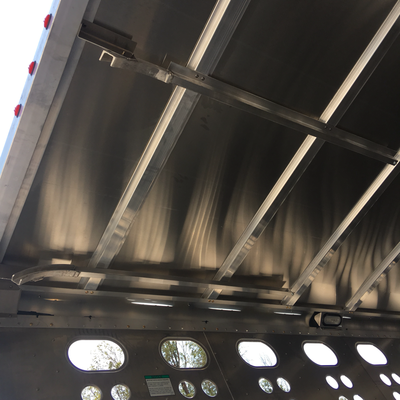 The Merritt Aluminum Load Floor Gooseneck Stock trailers are available in 16', 20', 24’, 28' & 32’ lengths. The Merritt Aluminum Flat Floor Gooseneck Stock trailers are available in 16', 20', & 24’ lengths. 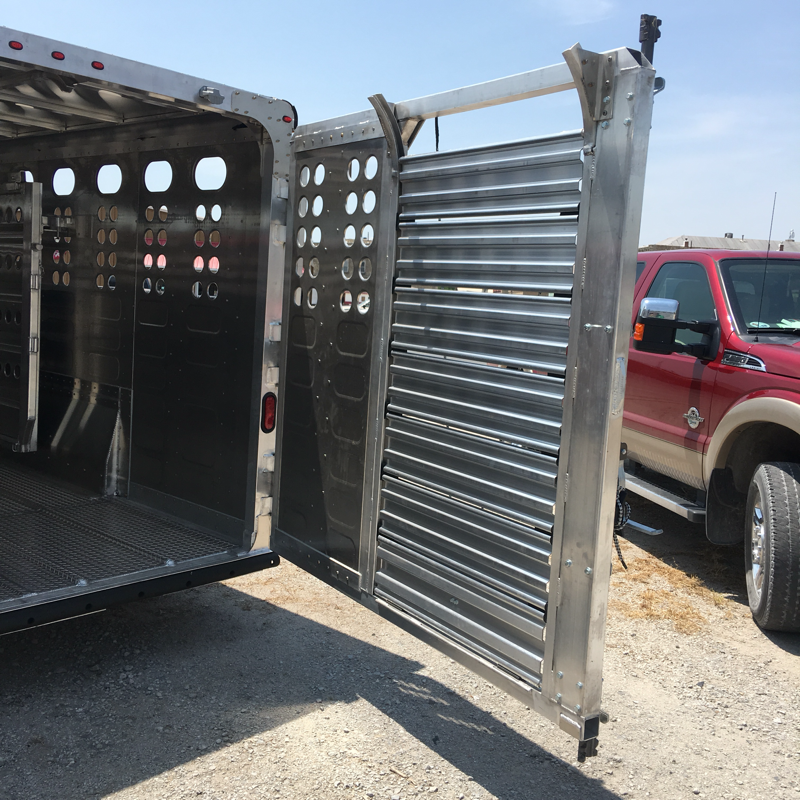 Merritt Gooseneck Aluminum Stock Trailers: THE ADJUSTABLE GATE OPTION. The Adjustable Gate Option is available in a Full-Swing, Swing Open Pass Through Gate, and a Slide Open Pass Through Gate. 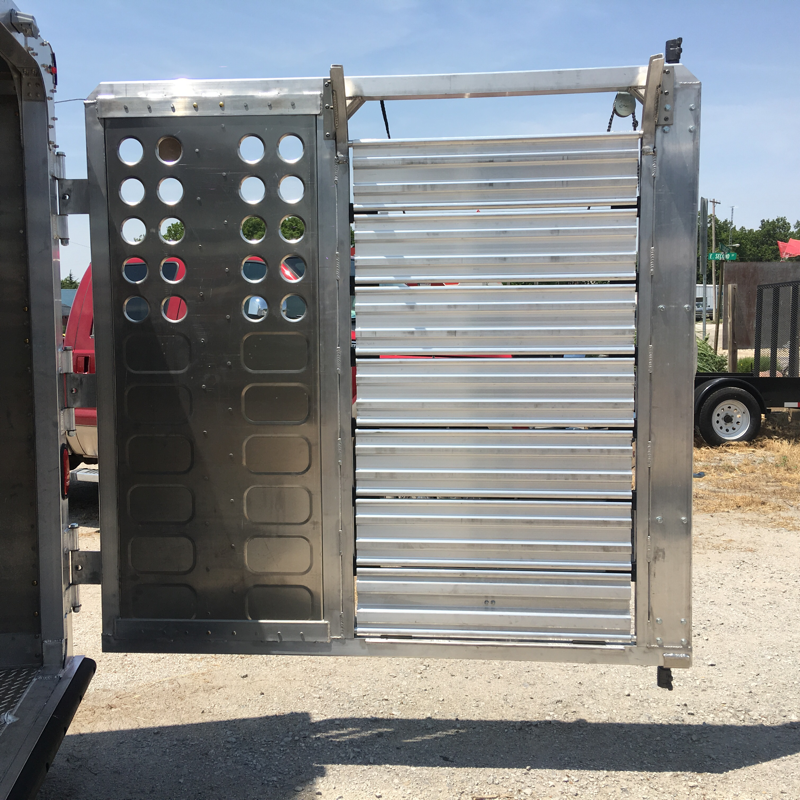 This new gate option from Merritt Equipment Company is designed for the stocker operation that needs to haul multiple classes of livestock. 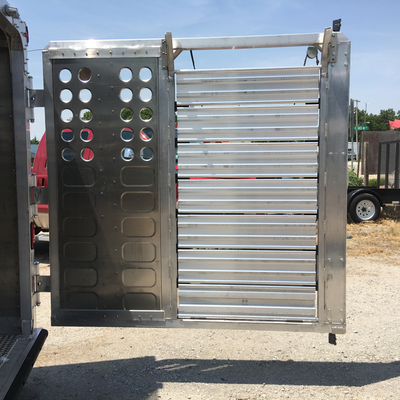 The design principles of this adjustable gate were founded around ease of use, the comfort of livestock, and long-term durability. The benefits of this adjustable gate include low profile roof-bow mounted adjustment tracks to maintain loadable space, nylon adjustment brackets and rubber blocks to prevent wear from vibration and to reduce unwanted noise, while locking mechanisms at 4 points and a center of gravity that hangs from the top rail will keep wear on the locks and latches to a minimum. The photogallery below contains the pictures of numerous optional features. 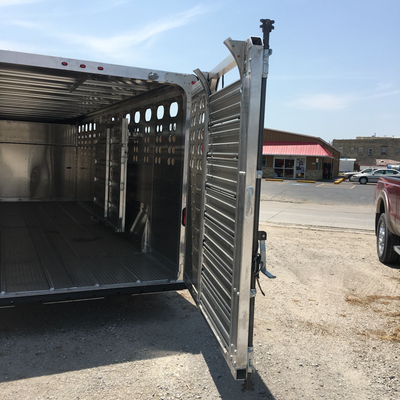 The photogallery below shows a 20' Gooseneck Merritt with optional Nose Access Door and Lighted Sign Mounted on Front End of the Gooseneck.